Announcement Hello everyone! Welcome to my new Etsy Shop! The perfect place to find an inspiring original piece of dragon or fantasy art. I will be adding prints soon as well, so please check back! Hello everyone! Welcome to my new Etsy Shop! The perfect place to find an inspiring original piece of dragon or fantasy art. I will be adding prints soon as well, so please check back! I'm excited to finally be creating prints of my artwork and listing originals from my books! Which brings me here, to Etsy, to share my artwork with you and others! I hope you enjoy my artwork and find something that interests you. You can also follow me on Facebook, Instagram, and Twitter @SandraStaple for contests and giveways! Don't quite see something you like here? If you are looking for original artwork, I am open to commissions right now, and also have more artwork on my website that I haven't yet listed on here. This shop is BRAN new for me, so please bear with me while I get items listed for sale. I hope you enjoy! 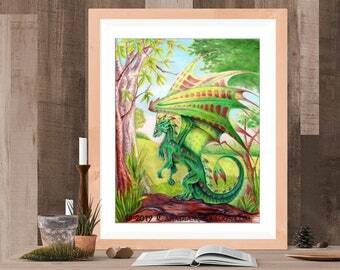 Dragon Artist, Fantasy Artist, Author and Illustrator of Drawing Dragons and Drawing Fantastic Dragons. Wife, Mother, Reef Fishtank Keeper, Gardener, Sculptor. Follow Me on Facebook, Instagram, Pinterest, and Twitter for more!